In a small single-room house in the Banaadir district of Somalia, dozens of Christians worship in secret out of fear of persecution in a country where no official churches exist. They sing, dance and testify — though not as exuberantly as in Christian services held in other African nations. Another woman wearing a blue dress and holding her Bible prayed to herself. “I give thanks to Jesus Christ for saving me from attacks and not being hit in the explosions,” she said. Hundreds of Christians in Somalia, typically foreigners from nearby countries who work across the East African nation, fear Muslim extremists — both jihadists in al-Shabab, a group linked to al-Qaida, and rogue elements among their otherwise peaceful neighbors — would kill them if they knew they held Christian services. Around 99.8 percent of Somalis are Muslim, according to the World Bank. John, who is a Kenyan pastor and a building contractor, has been working in Mogadishu for the last five years. Among his congregants are a few Somali converts who also live in fear in their own country for choosing Christianity. In recent years, the situation for Christians in the Horn of Africa has worsened, as illustrated by killings shared on social media. In the region under the control of al-Shabab, the militants hunt for Christians. The militant group holds to the strict Islamic doctrine of Wahhabism and promotes an extreme version of Sharia law. But local clan elders support them, acting as intelligence gatherers who report suspected non-Muslims. 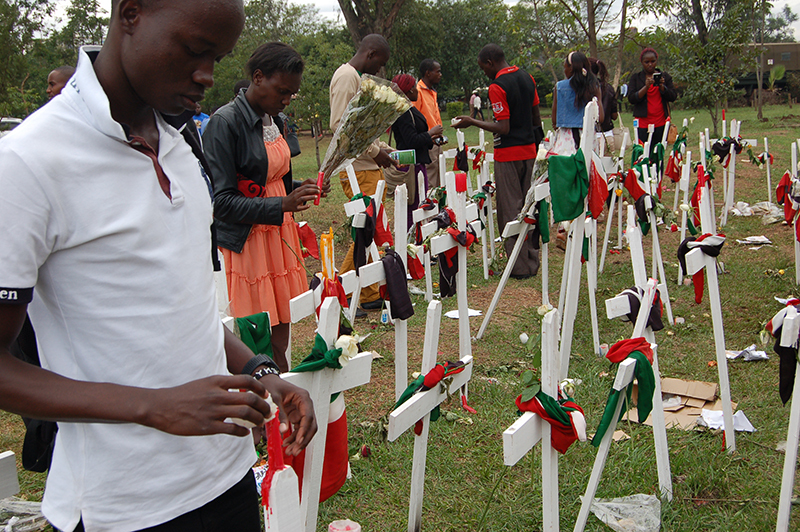 Kenyans still vividly remember the attack on Garissa University in April 2015, when al-Shabab fighters singled out and killed Christian students. The U.S. State Department has labeled al-Shabab one of several “entities of particular concern,” based on a recommendation from the U.S. Commission on International Religious Freedom. That label is used for groups that commit “systematic, ongoing, egregious violations” of religious freedom, according to USCIRF. Christians in Somalia have lamented their lack of freedom to worship. In August 2017, the only remaining Catholic church in Somalia was closed a few days after it opened temporarily. A public outcry resulted from the opening, with many calling for the church to be shuttered. Politicians listened. Catholic Bishop Giorgio Bertin, who oversees Djibouti and also acts as the pope’s representative to Somalia, said it would be hard to open a church in the country. John, the pastor, wondered why Muslims often were allowed to worship freely in foreign countries but their leaders often barred or stood by as others barred foreigners from worshipping in their countries. “That’s very bad and they should think about it,” he said.